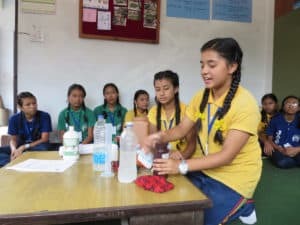 One tool (WATA™) for autonomy of schools and science curriculum: Through the set up of electrolysis of salted water in School Club, the production of 0,6% sodium hypochlorite by pupils, can be used for water treatment at school, cleaning premises, as well as a neutral disinfectant for wounds – Dakin’s solution – that can be useful for the school pharmacy. 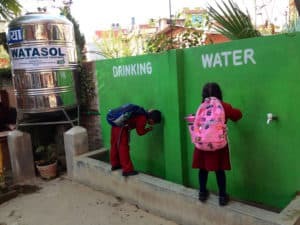 The WATA™ is appropriate for urban and rural schools to foster children’s understanding of safe water as well as school’s autonomy in disinfectants. The device requires only water, salt and electricity to function. The pupils and teachers first prepare brine solution at 25g NaCl / litre. 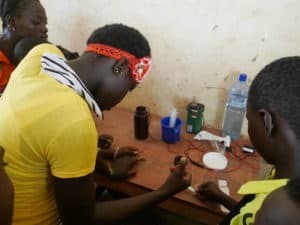 The WATA™ device needs to be immersed in the salt water and connected to a reliable source of electricity (grid or solar kit). The salt water is converted into sodium hypochlorite solution with a 6 g/L concentration of active chlorine through a process known as electrolysis. WataTest™ reagent allows to easily check -drop methodology – the concentration of chlorine produced. Lastly, to ensure safe drinking water, free residual chlorine (FRC) is monitored with WataBlue™. Both reagents can be produced locally. A Mini-WATA which produces about 500ml of Chlorine in 3h using salt and water, costs USD 150. If no electricity is available locally, the device can be operated with a solar panel. 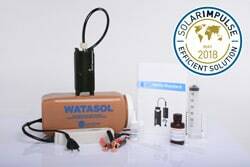 A Mini-WATA ™ solar kit costs USD 350.